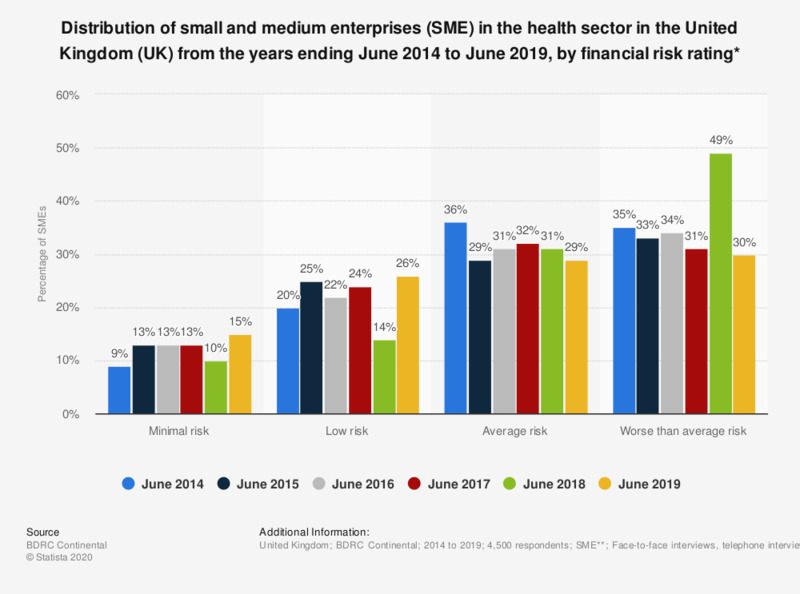 This statistic shows the distribution of small and medium enterprises (SME) in the health sector in the United Kingdom (UK) from the years ending June 2014 to June 2018, by financial risk rating. In June 2014, it was found that 35 percent of health sector SMEs were rated as having worse than average financial risk. In 2018, this increased to 49 percent. * Health and social work. The respondent was the person in charge of managing the business’s finances. Data was collected via interview. Everything On "Small and medium enterprises (SME) in the UK" in One Document: Edited and Divided into Handy Chapters. Including Detailed References.